I have some PDFs which are written in Arabic, I tried to convert into flash books but they are flip from right to left. I’d like to find some converter that can make a right-to-left flip flash book, can PDF to FlashBook do this? Good question, PDF to FlashBook do have this feature. It can help you make a flash flipping book which is written in Arabic or some Japanese or any language that reads from right to left. Just need some easy clicks. 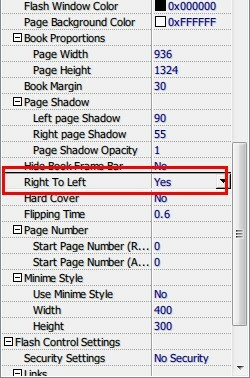 Set “Right To Left->Yes” then apply it. Done, you now have a flash book flips from right.